CONGRATULATIONS TO FRANCE’S NEW FIRST LADY, BRIGITTE TROGNEUX, THE WORLD’S FOREMOST COUGAR! Donald Trump lost the women’s vote by twelve percentage points in the 2016 Presidential Election. But when it comes to marriage, he is clearly the lady’s choice. Most single women would react with horror if they were told they desire a Trump-like husband, but that’s what millions secretly want. They seek older men, when any cougar can tell you that YOUNGER MEN ARE BETTER! 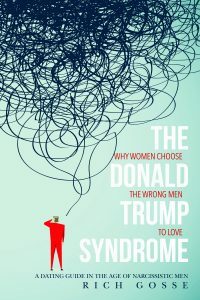 The Donald Trump Syndrome: Why Women Choose the Wrong Men to Love is the first book that identifies key Donald Trump qualities that most single women unknowingly endorse as those of the ideal husband. The book applies this to the dating world and reveals why so many women can’t meet a good man. The Donald Trump Syndrome divulges why marrying a Donald Trump clone would be disastrous. It also documents how single women in America overlook millions of good men, especially younger men, because they are the opposites of President Trump. Best of all, the book provides a step-by-step blueprint for how to identify a good man, where to find him, how to meet him, and how to forge a lasting bond.